Creating your own custom needlepoint pillow is quick and easy with the ability to upload your photo right to this page. You are given the ability to preview the look of your pillow immediately. If your pillow doesn’t look quite right, just send us an email of the photo and we will make sure that it is customized to your specifications. Watch this video to learn how you can create the kind of stitch counted designs that will make even the best artists amazed by what they have created. After creating your design, choose a velvet backing from a variety of colors and with optional piping around the edges of the pillow. If you have a pillow that is at least 12 x 12 inches, it will come with a hidden zipper and a removable pillow form. If your pillow is smaller, it will be stuffed with stuffing designed to remain inside the pillow. 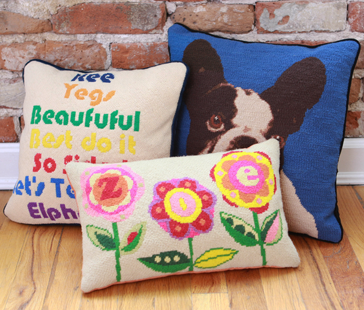 We pay close care and attention to every needlepoint pillow we stitch. As a result of our attention to detail and our devotion to quality, we offer a 100% satisfaction guarantee on the quality of stitching with every pillow we make.